All Opens, All of the time! 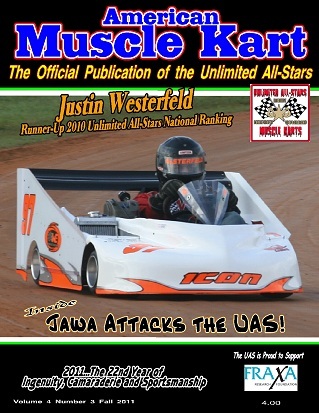 To get up up-to-minute UAS information "Like" the American Muscle Kart Facebook Page. Advertisers in the most recent issue of AMK. 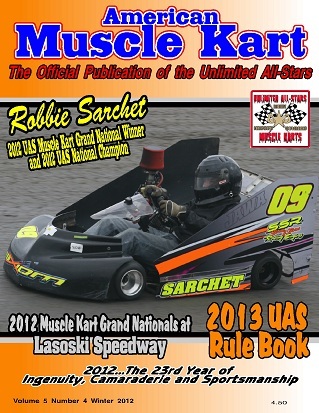 This issue features the 2012 National Champion and Grand Nationals winner Robbie Sarchet, complete coverage of the 2012 UAS Muscle Kart Grand Nationals at Lasoski Speedway and is the 2013 UAS Rule Book. Hard copies of this issue are still available. 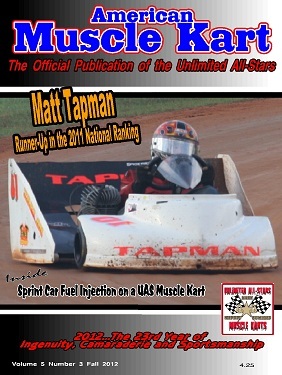 This issue features the Runner-Up in the 2011 UAS National Ranking, Matt Tapman, includes and article about sprint car fuel injection on a UAS kart and an indepth article about where the UAS has been and where it intends to go. 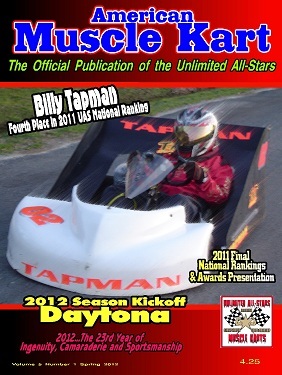 This issue features the #4 ranked driver in the UAS for 2011, Billy Tapman, the 2012 National Point Kick off at Daytona, and the 2011 complete final rankings. 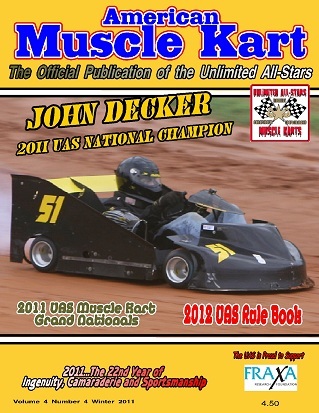 This issue features the 2011 National Champion John Decker, complete coverage of the 2011` UAS Muscle Kart Grand Nationals at Amelia Raceway park and is the 2012 UAS Rule Book. 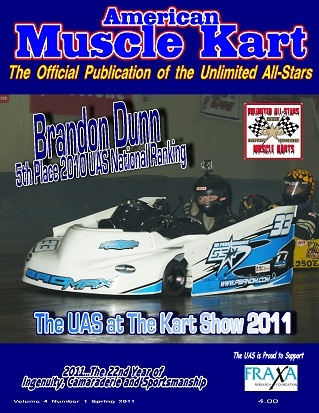 This issue features the Fifth Place ranked driver in the UAS for 2010, Brandon Dunn, the 2011 Kart Show, the complete 2010 national rankings, and the national awards presentation. 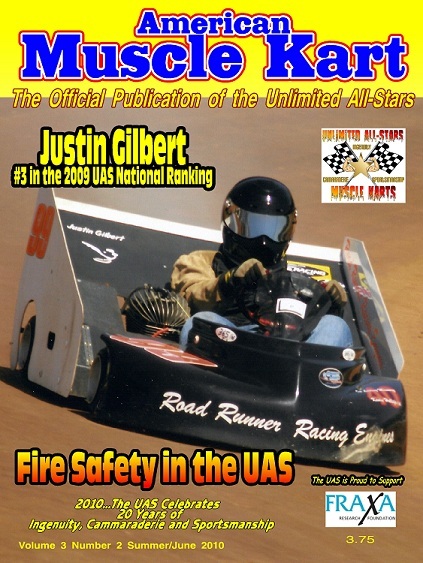 This issue features the 2010 National Champion and Grand National Winner, Justin Gilbert, complete coverage of the 2010 UAS Muscle Kart Grand Nationals at Clay City Speedway and is the 2011 UAS Rule Book. 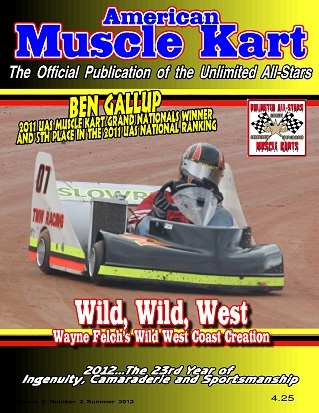 This issue is out of print but is available as a pdf file on cd for $5 which includes postage. 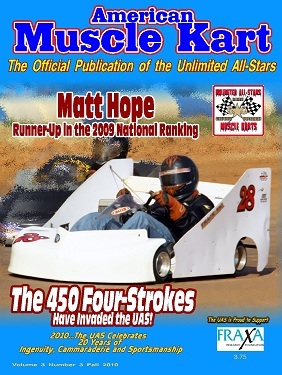 This issue features the 2009 #2 nationally ranked UAS racer Matt Hopet. 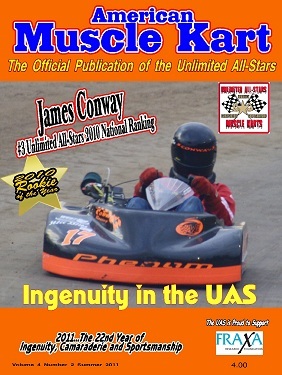 This issue also has an indepth article about the 450cc four strokes engines that some UAS racers were experimenting with. 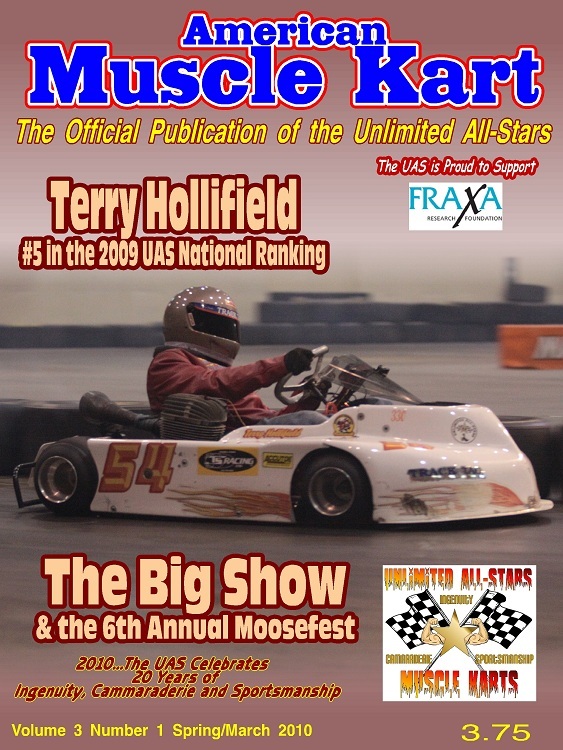 This issue features the 2009 #5 nationally ranked UAS racer Terry hollifield, The Big Show held in Charlotte, NC, the complete final national driver rankings and the awards presentation. 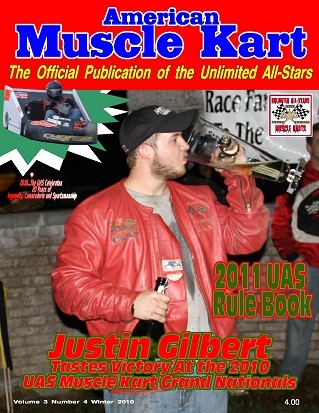 Hard copies of this issue are still available.. 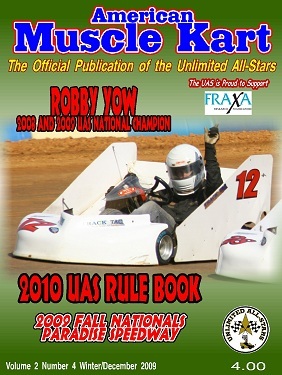 This issue features 2008 and 2009 National Champion Robby Yow and covers the action at the UAS Fall Nationals at Paradise Speedway. 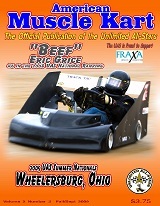 This issue features 2008 Number 6 Nationally ranked driver Eric "Beef" Grice, coverage of the 2009 summer Nationals at Wheelersburg Raceway.. 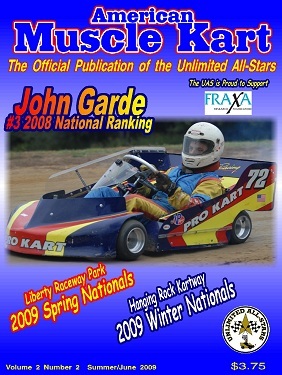 This issue features 2008 Number 3 Nationally ranked driver John Garde, coverage of the 2009 Winter Nationals at Hanging Rock Kartway and the 2009 Spring Nationals at Liberty Raceway Park. 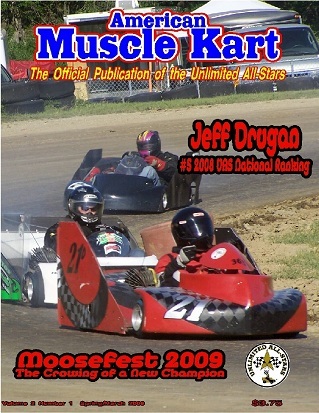 This issue features Jeff Drugan who was fifth in the 2008 National ranking. It also covered the National awards presentation and well as the complete final national rankings. 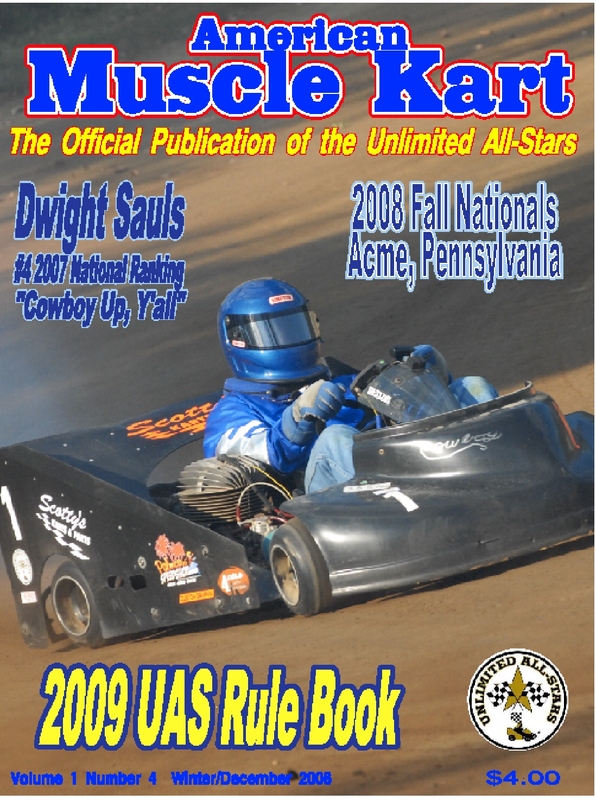 This issue served as the official 2009 UAS Rule Book, Feature Dwight "Cowboy" Sauls who finished 4th in 2008 national points and features the 2008 Fall Nationals at Acme Speedway. 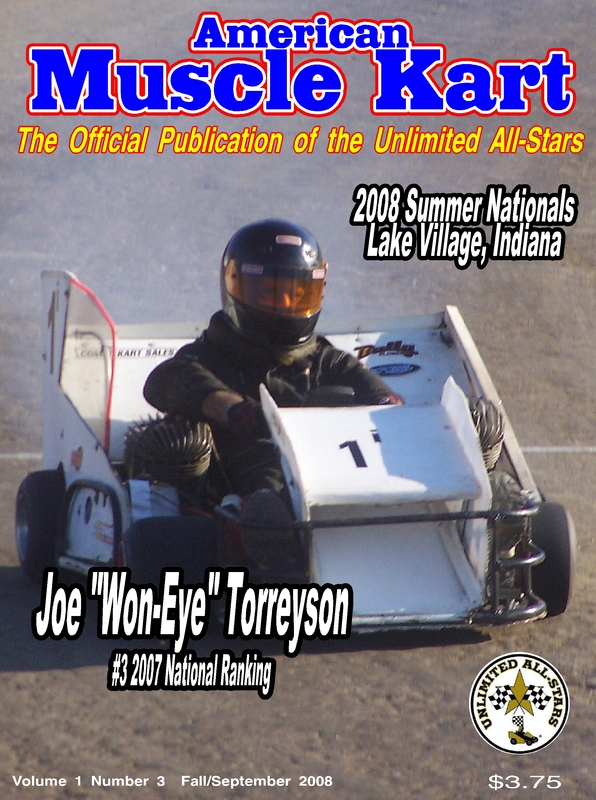 The 2008 Summer Nationals, 2007 Regional Champions, Features Driver - Joe "One Eye" Torreyson . 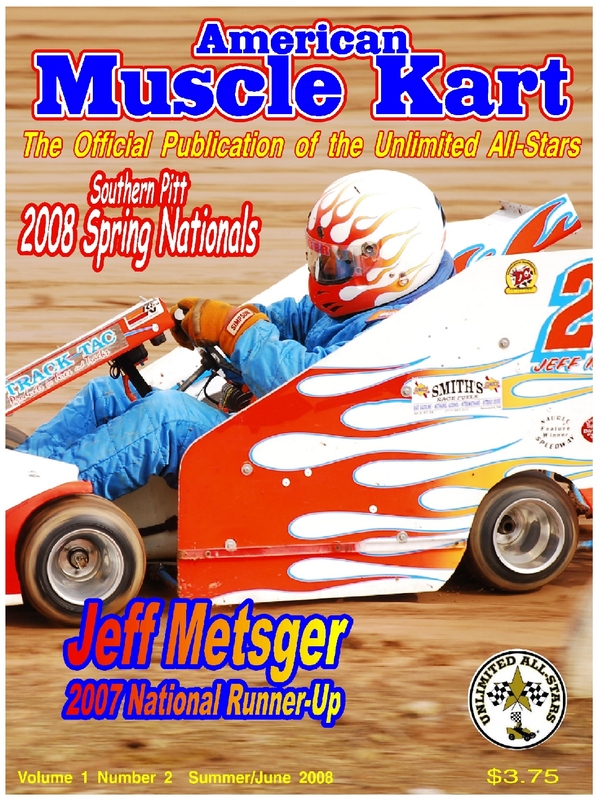 The 2008 Spring Nationals, All time Regional Champions, Featured Driver - Jeff Metsger. 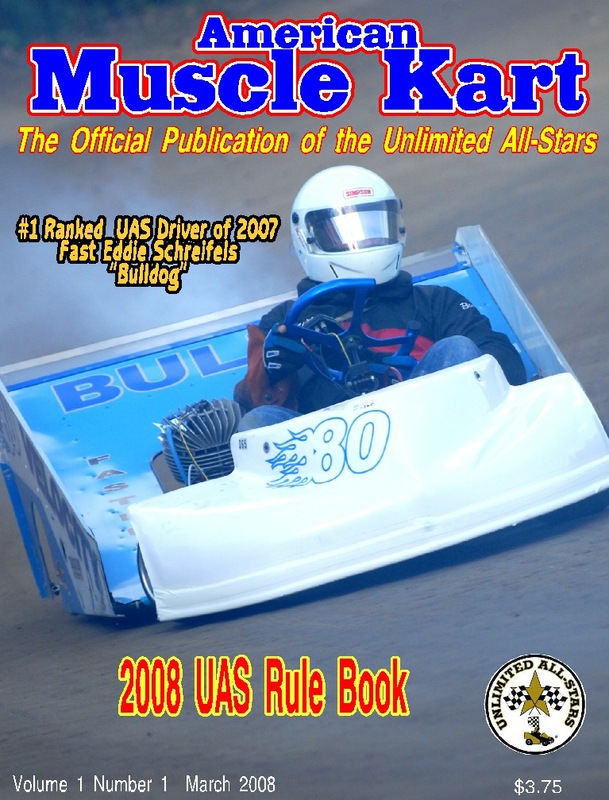 The 2008 UAS Rules, The 2007 Fall Nationals, The 2007 Winter Nationals, Featured Driver-Fast Eddie Schreifels and more. Unless Otherwise specified, all subscriptions will start with the current issue. To order back issues, specify which ones and add $4.50 per issue. All prices listed are for orders from with-in the Contintenental USA. For orders from outside of the Continental USA please email for a price quote. We will send you a paypal invoice based upon the postage cost to your location. An additional "postage" fee is added to pay-pal orders to cover electronic processing fees. Availability of hard copies was accurate on that date but is subject to change at any time.